And good news- they're coming to a high street near you! So everyone already knows pyjamas are the best thing ever right?? Don't they? If not, why don't they? How could anyone think anything was any better than beautiful comfortable clothes designed specifically for the greatest hobby of all time- napping? I don't have time for people who say they sleep in just an old top or some pants. And don't get me started on those who say they sleep naked. Leave it out Marilyn- take off your Chanel No. 5 and get a nice pair of fluffy pyjamas adorned with squirrels/deers/insert other woodland creature here and I can guarantee you'll be a lot happier. My passion for pyjamas has been going a long time and although pink zebra print ones will always have a place in my heart, and my wardrobe, pyjamas are upping their game. And there is a whole new market designated to luxury sleepwear. These new pyjamas are now so good that people are even wearing them out... Yes, like actually making a conscious decision to do so, not just like in that nightmare you had that time where you turned up to work still wearing your old Minnie Mouse nighty. Look at her, she looks happy- that's because she didn't even have to get dressed today and still looks great! My only problem with this is that generally those wearing said pyjamas are gamine beauties attending red carpet events. 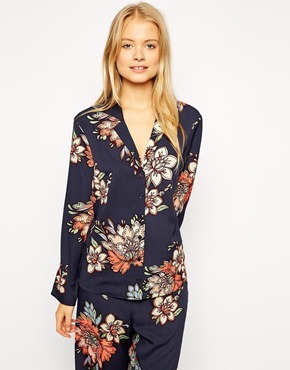 So my initial excitement for an excuse to wear my lounge wear out of the house was replaced by worry for how well this would actually work in the real world. Bear in mind I'm still hoping that a male may one day enter my life, if only to put a stop to the questions of whether I am a lesbian from my mother. But is it really possible for a chubby 5ft4 girl to pull a boy whilst wearing pyjamas? This Christmas I'm hoping to get my hands on a pair so I can test this out once and for all. Watch out boys of my hometown, I'm coming for you, and I am going to be looking... comfortable.